The Handley Page HP.52 Hampden was a British twin-engine medium bomber of the Royal Air Force (RAF). It was one of a trio of then-large twin-engine bombers procured for the RAF, the other two being the Armstrong Whitworth Whitley and Vickers Wellington. The newest of the three medium bombers, the Hampden was often referred to by aircrews as the “Flying Suitcase” because of its cramped crew conditions. The Hampden served in the early stages of Second World War, bearing the brunt of the early bombing war over Europe, taking part in the first night raid on Berlin and the first 1,000-bomber raid on Cologne. 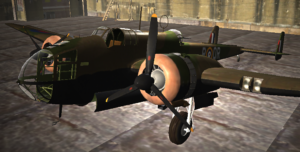 As the war went on, it became clear that the Hampden was unsuited to combat missions in the modern air war and, after a period of mainly operating at night, it was retired from RAF Bomber Command service in late 1942. As it was, by 1943, the other two medium bombers were also being superseded by the larger four-engined “heavies” such as the Avro Lancaster.